23 Oh Yeah! Oh Yeah! 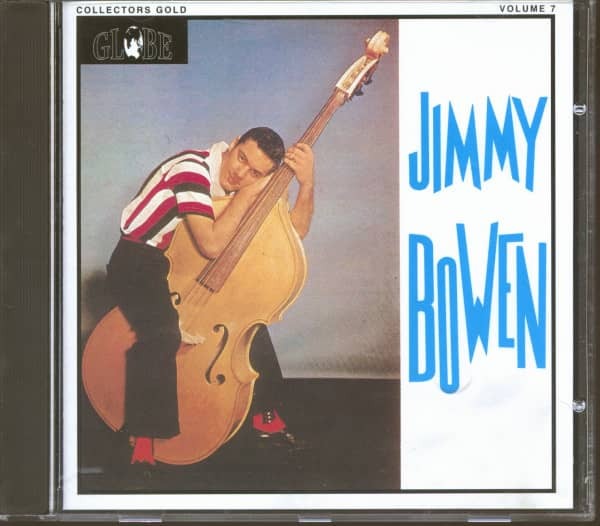 Born in Santa Rita, New Mexico on November 30, 1937, Jimmy Bowen grew up in Dumas, Texas, where his father was the local cop. A major player in the music business for five decades, Bowen wrote a scabrously tell-all autobiography, 'Rough Mix,' in 1997. In it, he told how Donnie 'Dirt' Lanier's sister, Teddie, got Buddy Knox's recording of Party Doll to Phil Kahl. At the time, Knox and Bowen were in a group in west Texas called the Orchids. "I got a call from Morris Levy himself," wrote Bowen. "He said he was wiring me $1000 and wanted to bring us to New York to discuss buying our masters for a label he was starting named Roulette. I was stunned. It took all day to get the thousand dollar money order cashed in Dumas because it was the biggest one they'd ever had." 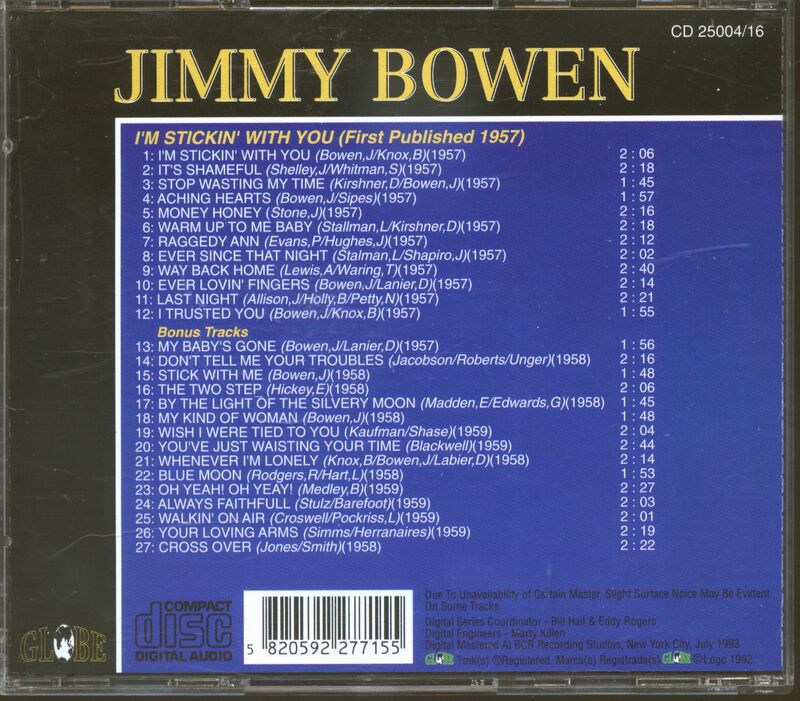 Both Buddy's recording of Party Doll and Bowen's record of I'm Sticking With You became hits. "My six month career as a teenage idol was about to begin," Bowen said. He played bass and sang, neither very well. "If the girls quit screaming, we're in trouble," he told his bandmates, referring to their almost complete lack of ability. "As showmen," he concluded, "we were uniformly mediocre to awful." Then came the cold bath. "With our record sales and airplay starting to fade," he wrote, "it was time to take a look at our royalty situation and discover how the record business REALLY worked." Bowen remembers that Levy's favorite phrase was "If you want royalties, go to England." It's hard to know if Bowen is playing bass on the master of My Baby's Gone (first issued on 'Rockin' In The Farmhouse' CD in 1994), but his less-than-charitable assessment of his buddies' proficiency is born out. 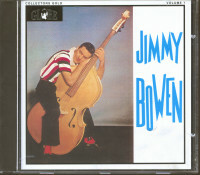 It was recorded at Bell Sound in New York (after recording at Norman Petty's studio in Clovis, the New York studios looked big enough to stage a reenactment of World War II, Bowen said). He quit performing in 1959, moved to Los Angeles and eventually became a producer for Frank Sinatra's Reprise Records. Moving to Nashville, he headed Elektra Records' country division, then Warners, MCA, and finally Capitol where he famously ran afoul of the label's franchise act, Garth Brooks. In Brooks, Bowen finally encountered an ego bigger than his own, and retired to his estate in Maui. There was a famous Nashville joke about Bowen in which the Devil appears before him in a dream and says, "I'll give you ten straight Number One hits if you promise me the souls of yourself, your wife, and all your children." To which Bowen replies, "What's the catch?" Customer evaluation for "I'm Stickin' With You (CD)"